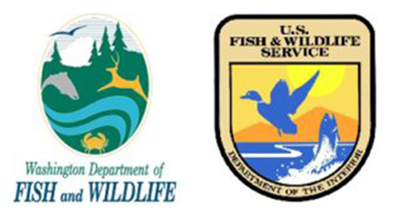 The Washington State Department of Fish and Wildlife (WDFW) and the U.S. Fish and Wildlife Service (USFWS) invite landowners on San Juan and Lopez islands to join us to learn more about conservation of the island marble butterfly under a Candidate Conservation Agreements with Assurances (CCAA). The USFWS will provide a presentation and an open discussion forum on incentives for property owners to enroll in the CCAA to engage in voluntary conservation activities that benefit the species. 2:00 pm-4:00 pm and 6:00 pm-8:00 pm. The island marble butterfly does not migrate and is only found on San Juan Island. After 90 years without a documented occurrence, the island marble butterfly was rediscovered in 1998 on San Juan Island. Island marble butterflies are most visible in the spring when they are winged adults, but for the rest of the year they are present as either eggs, caterpillars, or chrysalises. After an island marble butterfly emerges from its chrysalis, it immediately mates and lays eggs, flying only a few days before dying. For more information about island marble butterflies, visit our website below.